380 Tons Of Explosives Missing -- But When? However, that last statement isn't quite accurate. The Administration acknowledged that it disappeared after the last IAEA inspection, which occurred before the invasion. After the US invaded Iraq and visited Al-Qaqaa, they checked for but saw no IAEA seals and bypassed the bunker for more critical missions. That difference is critical, as it directly impacts on who moved the munitions, when, and to where. Many have speculated that the WMD Saddam supposedly retained made its way to Syria in a series of truck convoys spotted just before the invasion began, and Syria has not allowed weapons inspectors to determine whether they have Saddam's WMD. 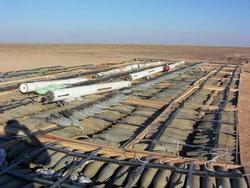 If the WMD did not exist, the trucks could have hauled the contents of Al-Qaqaa just as easily, and far less traceably. When Daddy first came to Iraq it was estimated that there was more than 2 million tons of ammunition stored in hundreds of storage places called �caches�. We may not have that much ammunition in our own country. Most of this ammunition could not even be used by the Iraqi military under Saddam Hussein and most has no use to the new military of Free Iraq. Saddam�s corrupt government sold or gave lots of it away to terrorists. Today terrorists try to steal the ammunition, so they can use it to kill innocent people. Some of it is used to make bombs that they plant in places where there are a lot of people. Other ammunition, like this rocket, is ready to launch right out of the container. These kinds of rockets are launched on our bases and convoys by bad people every day. So Daddy�s team goes to where the ammunition is and we keep it safe until big trucks come. Then we go out to the desert far away from people and stack the ammo close together, we �prime� it with special explosives ... and then we blow it up. Reacting to the IAEA announcement on Monday, Democratic presidential nominee Sen. John Kerry said the "incredible incompetence of this president and this administration has put our troops at risk and put this country at greater risk than we ought to be." These hysterical ravings from the Democrats should convince voters that anyone this panicky cannot possibly be trusted with any kind of command authority over our military, let alone guide us in an asymmetrical war with Islamic terrorists and the countries that sponsor them. Only .02% of all explosives...wow. In 2001, there were 5,967,780 flights. The September 11th attacks constituted four of those. That constitutes a proportion so infinitessimally small that it's almost like none of the flights in 2001 were hijacked at all - it's like the attacks never happened. Why doesn't anyone ever focus on the fact that 99.9999994% (or so) of all flights in America in 2001 were perfectly safe? Why are we so preoccupied with those oh-so-few flights that killed a few thousand people? Um...yeah, congratulations, Jesse -- now you understand why playing defense against these terrorists is so frickin' stupid. You can't possibly guarantee total security in such a vast aviation industry, so rather than wait for the terrorists to come after you, you go after them first -- the terrorists and everyone who funds and shelters them. You force them to come out in their backyard to minimize the chances that they'll come into yours. Putting aside the fact that no one knows when these munitions disappeared, the fact that they were still there after 12 years of UN inspections and sanctions establishes the futility of the entire UNSCOM process. (They left them piled up in these bunkers because Saddam told them he would use them in civilian construction projects. Really.) And if we hadn't invaded Iraq, we wouldn't be faced with 380 tons of missing munitions -- we'd be facing the entire stockpile of 2 million tons, distributed to whomever Saddam pleased. If we capture, control, and destroy 99.98% of all the munitions in Iraq, I'd say we'd done a pretty good job. I'd like it to be perfect, and I'd like to hear specifically how the Pandagon gang would guarantee that. So we were there on April 10, 2003, and the HMX and RDX were already gone -- which was why the IAEA seals were broken. And why do we know this? Because NBC was embedded with the troops and saw it for themselves. Do you suppose the New York Times will run a front-page article with that information for tomorrow's edition? Doubtful.